The race enters the Pyrenees for the first mountain stage but the final climb is not fierce. 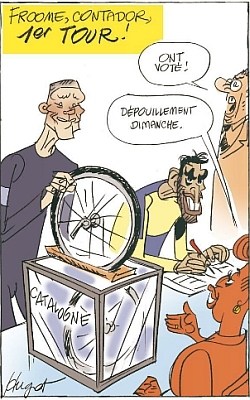 Instead this is a day when the descent could pick the winner because foul weather is forecast and the riders face a long and chilly ride down the top of the Coll de la Creueta in freezing temperatures. A battle between the big guns isn’t certain but they might feel compelled to turn up the heat… if the stage goes ahead. Stage 2 Wrap: Luka Mezgec took a second consecutive win, a double feat mirroring the back-to-back wins by Michael Albasini in 2011 and Gianni Meersman in 2012. The stage saw an attack by Thomas Voeckler but the big wide roads on the approach to Girona were fatal to his chances even if there were few sprint trains willing to lead. As they came to the finish Leigh Howard hard a great lead out but faded and once again Mezgec emerged from outside of the TV camera’s view, only this time it was his choice as he darted across the road and took a long flyer to the line. Mezgec is clearly the fastest in the race but what if he was the best dressed man too? Many suffered from the cold and it’s understandable but all the same, in this age of marginal gains it’s striking to see how many riders are ruined by rain. It’s not easy given riding in damp clothing at 40km/h in cold conditions means a huge windchill but it’s surprising just how many riders lose out because clothing can’t supply anything appropriate. The show goes on. There was talk of alternations because of the weather and snow closing roads but the latest is the race is going ahead as planned. 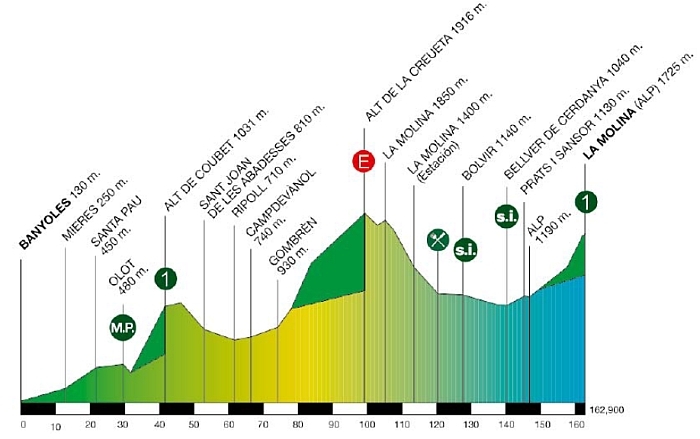 The Alt de la Creueta is 21km long at a gentle 4.5% but this includes a downhill sector and it peaks at 9% in gradient but crucially at 1916m above sea level meaning it’s one thing to go up but the race will descend in cold and wet conditions and cruelly pass the finish on the way down, lined with humming team buses with warm interiors and hot showers. The race then loops a section of the Cerdanya plateau before returning to the mountains for the ski-station finish in La Molina – site of Spain’s first ski lift – it’s 5.3km at 6% in the roadbook but a touch less in reality, with a maximum of 8% at two kilometres to go. The Scenario: yes the race goes to the Pyrenees but today’s stage is an appetiser, a tapas taster of the Pyrenees. A new yellow jersey is likely if not certain. The Alt de la Creueta is tough but comes far from the finish and the climb to La Molina is not normally where the likes of Nairo Quintana, Joaquim Rodriguez or Chris Froome soar to victory. It’s a harder climb and tactical, where sitting on the wheels pays dividends. But given the weather many riders might not want to sit still in the bunch including the top guns. The Contenders: normally I would have said tomorrow’s stage sees the big names in action and they keep an eye on affairs today but the weather might force things. If so Alberto Contador and Chris Froome should be the ones to watch but refer to the main list of contenders listed before Stage 1 for the relative state of play. Contador’s in form from Tirreno and Froome doesn’t mind the cold, remember the Tour de Romandie last year when he took second place behind Simon Špilak* on the shortened Queen Stage. Among the outsiders are Sky’s Mikel Nieve, if only for his name which means snow in Spanish. The long descent suits Caja Rural’s Luis Leon Sanchez, his modus operandi is to attack from a afar on a descent in a group, build a lead and then pick off the rivals to win solo. Why not Warren Barguil or Jakob Fuglsang for a change? Or José Serpa, strong in Paris-Nice. Talking of Paris-Nice, a short uphill finish suits Carlos Betancur and he’s still got some lardy insulation to cope with the cold and he might get the last laugh. Weather: cold and wet. One forecast says the zero isotherm sits at 1,400m meaning the hardest parts of the stage will be held in sub-zero temperatures. Another forecast says the finish at La Molina will be enjoy temperatures between -4ºC and 5ºC today. Either way a section of the race will be in glacial conditions. Worse, it’s going to be damp although the latest is that the chance of rain and snow is fading. While snow flurries are forecast they’re not expected to close the road, after all La Molina is a ski station that relies on getting tourist in when the snow falls. Bus or car is one thing and a bike race is another. Even if the roads are passable it will be a grim day, the idea of doing 80km/h downhill in damp clothing with -6ºC is extreme. Daily Diaz: Catalonia as a state appeared in the Middle Ages, when the counts of Barcelona ruled the country (as well as the neighbour kingdoms of Aragon and Valencia, united in the so-called Crown of Aragon). 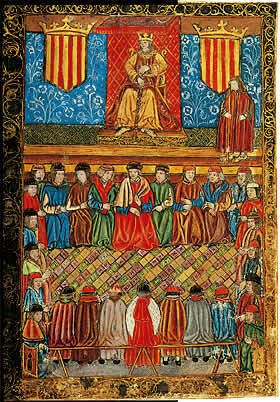 In the XVth century a marriage originated the Hispanic monarchy, and in 1714 Catalonia lost its self-government, which was restablished in 1932 (for a short time) and finally in 1979. Actually it was Simon Špilak who won the queen stage of Romandie 2013. Great wee pre-race reads will be popping in all week. GO GARMIN!!! The second half of the stage takes place above 1000 meters altitude! What’s the reference to Mezgec being best dressed? Looking at the finish photo: no leg warmers, no booties, no vest, no long finger gloves – not seeing what his advantage was? The choice of clothing will be crucial today. It’s bad Valverde is not around, would have like to see if he learnt the lesson from last Vuelta (and if he’s learnt to put on a raincape). I am sure Movistar’s move from Nalini to Endura was helped by that incident. PS: Sorry for the nitpicking, but the leader’s jersey is not yellow, but white with three green stripes. Can we have a piece on Pablo Lastras, the nicest man in the peloton please? There’s not much more to say, a very long career but far from the cameras. Not a big name but liked by many. Some used to call him “Barbie” because of his blond hair and long legs but the name never stuck. Weather on the race is akin to Milan San Remo of Sunday and if the predicted weather forecast materialises for Stage 3, it could well resemble MSR 2013! Many new players in the clothing world have arrived at the top level and several (new AND old) seem disinterested in providing appropriate foul weather kit. knocked up cheaply eastward. Specialists, in that area of expertise cost, especially for small production runs. I find it odd that manufacturers will stump up huge amounts of cash and clothing to sponsor a pro team and then skimp when it comes to the detail. As evidenced by your observation of Paolini pouring hot beverage on his gloves on Sunday. The clothing has come leaps and bounds over recent year, however, I believe that at a certain point, for example MSR in 2013, there is no amount of technical clothing that will produce miracles. Yeah, some of us are old enough to remember racing in wool…in the rain/sleet. Funny thing I don’t feel sorry for them they are on salary. Senior Inrng, Excellente, ” lardy insulation” be careful you may get dropped from Betancurs christmas card list!